direct impact a bomb blast has on community, on a family. It’s shocking. It’s horrific. It’s real. Stop talking about the technology. Talk about the people and the issues – this applies to every story, from war to protests to natural disasters. And I say this as someone who runs the Social Media for one of the largest news organisations in the world. It is particularly apt for technologists and a very important thing to remember when we talk about the systems that we make. It is just as important to focus on the people behind the stories, the report behind the red dot. A reminder to empathize, and whenever possible to assist in the alleviation of suffering. As humans we seriously need to be reminded what it means to have your life suddenly turned upside down. Whatever form that might be. Be it from poverty, war or natural disaster. We’ve seen so many affected, from Haiti, Cuba, North Eastern America, to Palestine and Israel and in my current location – Kenya. We need to zoom in, care and assist someone. Start somewhereâ€¦and as Jen Pahlka of CodeforAmerica recently told me. Lets work on the hard stuff. I am getting increasingly interested in Complex systems science, not just to understand our complex world, but also to learn what can be done in terms of collaborative problem solving. The pre-eminent organization NECSI that studies this makes a point that I think bears repeating, and points as to why we should exceedingly care about individuals when systems start breaking. Allow me to add one. To be innovative, you need a healthy modicum of humility. Many a conference has the theme of innovation as part of discussion in almost anything. Innovation in technological context, in development and most recently, innovation in philanthropy. Innovation is something many technologists, futurists and business leaders are in search of. It is like the modern day holy grail in the face of disruptive tech trends that usurp business models, not to mention Moore’s law being ever more apropos with every product launch cycle. As part of the Co-Founding team of Ushahidi, I have the privilege of working with an incredible team that is globally dispersed, with our team call every week encompassing 7 timezones. I mention this because as we have built platforms and tools over the past 3 years, I am continually learning about what it means to innovate. I say continually, because it is a process that is ongoing and does not stop at having a cloud based service (Crowdmap) mobile applications and a semantic data collection curation tools in the pipeline (SwiftRiver). One of the key things I have learned about innovation is that it takes humility to get on the ground; sometimes quite literally, to appreciate the view of an issue or a problem or simply someone else’s story. This became quite clear to me when I was in Zambia last September for the elections, the Ushahidi platform was used to crowd source information about the electoral process. Problem: Being surrounded by rowdy youth, as we approached a polling station; this after checking with the police station and being told that all was well. I did not sign up for alerts from Bantuwatch.org. If I had done so, I would have realized that the reality on the ground was quite different. The view from the ground or the crowd is one you need when assessing any situation. As part of the Ushahidi strategy we started an innovation hub in Nairobi. My colleagues and I agreed that we needed to give back to the tech community that helped us get to the global stage plus, we needed a base and office in Kenya. With generous support of The Omidyar Network and Hivos we set out to create a space for technologists, business leaders, developers, designers and the larger tech community. The space helps us convene, collaborate and celebrate this narrative of African tech. Each day, developers congregate, work through their vision of what utility they can provide, we hack, play foosball, have coffee and hack some more, get on Skype calls at odd times of the night, then yesâ€¦hack some more after that. Ushahidi is still largely virtual, it is in our DNA after all; the iHub is one of those nodes of communities that is a key part of our interactions. Other nodes are the offices of our partners in the bay area, Mozilla who let us organize meet ups and the countless coffee shops and co-working spaces that cater to the modern day location agnostic web worker, volunteer or simplyâ€¦geek. Being on the ground, connecting with each node in our global interconnected community is something I can honestly term a gift. In September I travelled to Lusaka, Zambia on the eve of elections. There, I got to see first hand how our platform was being deployed on the ground, publicized over radio; to give citizens a voice during the elections there. While I was there, I met with a group of young developers, volunteers and journalists who were exploring how to grow the nascent tech community in Lusaka. It reminded me of the early days pre-Ushahidi, where Erik, myself, Jason Mule, Shashank Bengali, Brian Muita and others would meet at restaurants that had wifi, to connect. To share, and later, to collaborate. That network that exists in real life and virtually, is one that is without the brick and mortar of co-working spaces and set the foundation for what happened after. I think that is what I helped us innovate. A mix of on-the-ground reality, David Kobia’s coding jujitsu and most of all the open source community online. 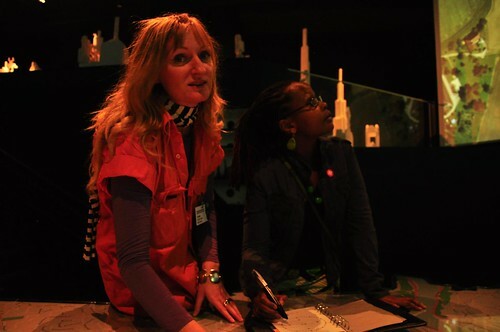 This is a mix that works for us and we learn together to build the global Ushahidi community. It is not easy. One thing is that when people are gathered based on passion for what they do that is when you see innovations. When there is a direct correlation between the problem and the possible solution, the promise of the tech entrepreneur or mobile developer is to architect the avenue. Pierre Omidyar observed this at ONEF 2011 and I see it in Africa’s techies. We have a long way to go, but we can imagine the world differently and go about building out our vision. Having the tools and the team to do this is like being handed Thor’s hammer. I notice the growth of similar spaces like the iHub in Africa (with glee!) and I notice that countries and philanthropic organizations are setting up self styled tech cities. Some will work, some will not work. In Kenya there is the idea of Konza City. While it looks great on paper and I really would like to see it happen, but I am cautiously optimistic. Why? Partly because of what Roger Malina’s analysis, that most governments haven’t a clue how to innovate, much less foster it. He included much more than I can add here, if you have 21 minutes, definitely watch his talk. For nations and Foundations; If the goal is to spur innovation, it takes humility to listen, to look around and participate with innovators wherever they may be first. To see potential where others see trash, to support and uplift without supplanting and dictating. To connect with others based on passion, that is where where the most influence happens. There is a need for acknowledgment that innovation is a culture with a thumbprint that can be unique, dynamic and most of all long range. One has to think about social Impact, philanthropy or investing. To see solutions where others see problems you have to get back on the ground and listen. This is something we are striving for as we grow Ushahidi around the world and invite others to join us in translating, localizing and Crowdmapping the issues you care about, build communities around the issues and explore solutions collaboratively. PS: Currently heading to Davos from DLD2012 if you’d like to collaborate on Innovation, Tech, Africa, ping me using the contact form above or @afromusing on twitter. Over the last year I have had the great fortune of mind melding with various people with incredible ideas. As some of you may know, I am involved in Ushahidi, an open source platform for data collection, visualization and interactive mapping. Ushahidi has gotten its notoriety in the crowdsourcing sphere, with growing adoption around the world. From Kenya to Russia, Poland, Mexico, South Africa, Italy and countless other countries; it is something I continue to marvel at while enjoying the ride of learning; with a global community of hackers from Ghana, Malawi, Netherlands, US, Kenya, Poland etc, I marvel even more. The idea behind the platform is simple. That anyone, given a channel to say ‘This is what I see’ and send that information via SMS, email, web and twitter. With Ushahidi’s plethora of mobile apps, reporting via smartphones can also be done quite seamlessly. With the Android app SMSsync, you can be your own SMS gateway. What this means is you can run a hub from your Android phone, such that any sms’s sent to you get sync’ed with a call back URL which can be an Ushahidi deployment or another server based application. So with the channels of data collection sorted, you of course have the processing capability that is available on the cloud (Think SwiftRiver), and the visualization component which can help convey the data in a compelling way.Maps. Things are getting even more compelling with plugins such as Cloudmade (Think preety, preety maps), and bookmarklets that can overlay Ushahidi data with other data available in the open layers format. Point is, the tools to create a visual from the collected data is also sorted. Beautifully too. Now to the Internet of things. My first encounter with this idea was from listening to Elder of the Internet Vint Cerf at Lift09. He mentioned how you can have sensors in your cellar that make sure the temperature of the wine stays constant, and does some automatic reporting via internet to you if there is an anomaly. Those sensors have IP addresses and are nodes in your network. I did not think of it in terms of ‘Internet of Things’ at the time, but looking back now, that is exactly what he was describing. Other sensors abound, from the innovative Enphase inverter for giving you information on your energy generation from solar panels to the trash tracking devices used in the MIT Senseable City lab projects. Another great way to grasp this concept is to check out the twitter account of London’s Tower Bridge, and read this account of how it was set to tweet. Now take these two ideas and meld them in different ways. Allow me to use the word holistic. As in holistic near ‘real time sense-making‘, incorporating the internet of things, with crowdsourced data delivered through channels that encourage participation. There is an opportunity to see things dynamically and not just do after-the-fact post mortem. This could work for flash point events like the Haiti earthquake (taking data form Geiger counters etc + crowdsourced data like that available on the haiti deployment run by Noula.ht. It could also work for longer term events such as the BP Oil spill in Louisiana. …the closer to real-time one can get the right answer and respond, the better. And milliseconds matter. – Data from things/sensors can trigger a report online if a tracked value reaches a certain threshold or meets certain criteria. For example, the Copenhagen Wheel by MIT Senseable lab. The wheel contains sensors that monitor carbon monoxide levels in the air,NOx/Nitrogen Oxides, a measure of air pollution, noise, ambient temperature and relative humidity. The data is accessible on a mobile phone app and can be shared with friends or even the city. – Data from people filling out a form, sending an email, SMS or twitter message. This can be qualitative in nature, and use of the Ushahidi platform provides a way for citizens to participate in data gathering, plus sign up for alerts that are relevant to their concerns. An example that can be useful to check out is the Where Are The Cuts map from The Open Knowledge Foundation in the UK. Combining the various sources of data (Open layers can be used to distinguish various types of data/color coding points of data can help to differentiate between sensor data and crowdsourced data). A dynamic map of information can then emerge that is not so much a snapshot, but an animation. 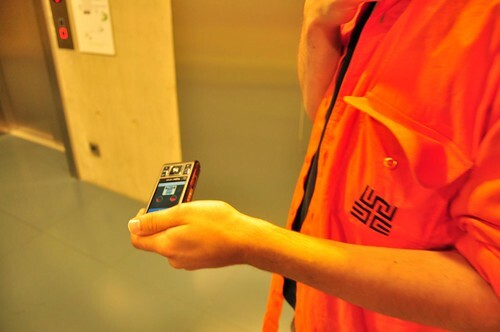 The Mobile Individual Measurements of Air Quality (MIMAQ) project out of Netherlands gives a perfect example of combining sensors, air pollution information and AR. This wired piece on ‘When augmented reality hits the Internet of Things’ is also instructive and interesting. Change is at times compelled by insight. The insight from using technologies/ideas outlined above could lead to behaviour change if we can make data relevant to an individual. Relevant to the decisions they have to make based on the information they have at the time. 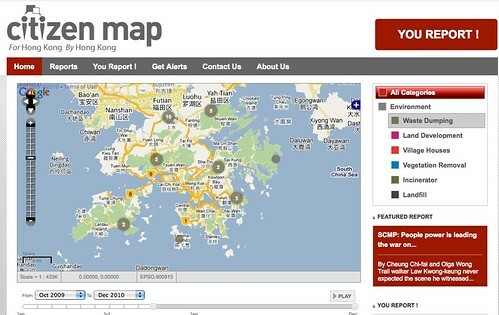 For an idea that mixes some of the above ideas and adds relevance, have a look at Mapnificent. Mapnificent from Stefan Wehrmeyer on Vimeo. [Mapnificent] …allows you to set a point in your chosen city and a map will display the entire area over which you could travel by public transit in a given amount of time. It also allows you to see an area that is both 15 minutes away from yourself and 15 minutes away from a friend by transit, and since it is integrated with Google Maps, allows you to search destinations within that specified area. The reason why this could be interesting, is that it has the potential to give journalists leads that they can follow up on and gather more facts on issues such as toxic waste dumping. It is harnessing the power of the people to help make Hong Kong a better place. This feeds into the idea of changing behaviour. If individuals/corporations realize that the public is watching and able to report incidents, would they still engage in such activities? Say we had near-real time crowdsourced data from the public, and data from sensors all in the public domain; what could we do? What kind of projects could we come up with? During TEDxNairobi, Erik Kigada an architect with Planning Systems shocked many of us in the audience by revealing something we did not know about. The city of Nairobi does not have a coherent master plan. The city is using 1999 plans to build in 2010. This presents myriad problems for businesses and individuals who need to plan. His point was made stark by the road construction happening while the event was going on. If a master plan existed showing that a bypass was planned, the architect who built the auditorium would not have put it near the road. There is an opportunity for emerging economies, rapidly growing cities to become smart cities. They can do this by taking a cue from the Senseable city projects. Current, near-real time data can be gathered with the help of the crowd, to provide pertinent information to urban planners, academics and leaders. The hope here is that they can make well informed decisions that take into account the flowing reality of the city. There is also the opportunity for education and academia to use participatory systems to link science, data and student participation. Relating the exploration of built/urban environment to the scientific method of observation, data collection and analysis. I am interested in your ideas on how we can use these technologies and ideas to address the many challenges facing our world in Health, Education and Environment. I am particularly interested in figuring out a joint project in Kenya, please leave a comment or contact me to explore and collaborate. – Workshop on Applications of Wireless Sensor Networks for Environmental Monitoring in Developing Countries to be followed by Conference on Wireless Sensors Technologies for Environmental Monitoring 28th February – 11th March 2011 Trieste, Italy. – JP De Vooght blog and twitter @jdevoo. 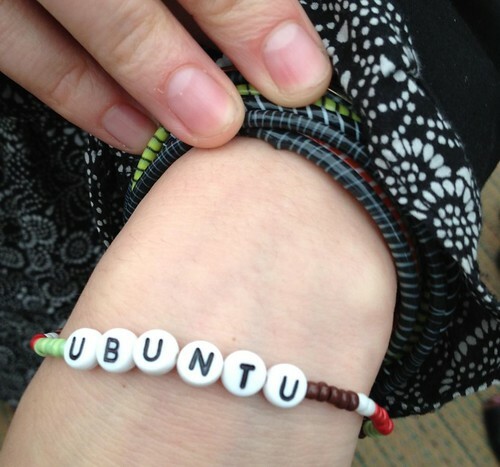 This post titled ‘Arduino Meets Ushahidi’ is particularly fun. 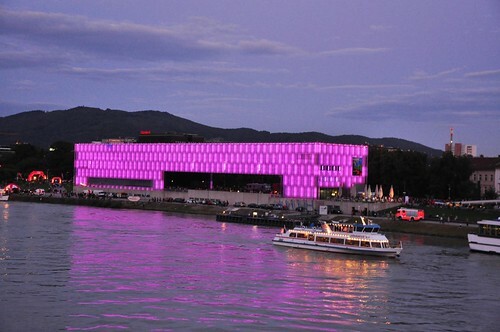 At Ars Electronica in Linz, I was struck by the amazing pieces exhibited, and more so by the Ars Electronica center. 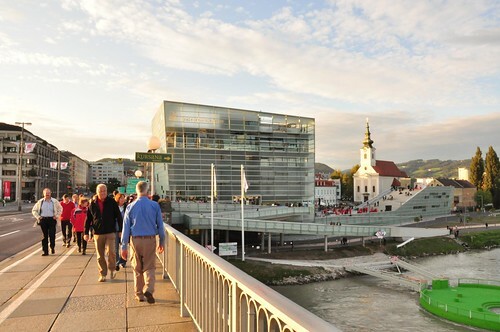 It is set very near to a bridge on the Danube river.The Exhibitions archive page uses a schematic of the center to give you an idea of what is curated where. The outdoor space atop the main gallery and before the future lab space seems to tie the old architecture of the church to the futuristic style of the Ars Center. Click on the image below for a larger size, the church is to the left of the future lab stairs. It is one of those buildings that people either love or hate…I loved it. At night, the LED lights that line the outer glass wall change color. Something like a nocturnal visual surprise every time you glance at it. Ahem, pardon my digression. Back to nerds needing art. This has admittedly been a very busy year for me, and I have to admit that I did not expect it to be. With time, I’ve realized that being in the tech space can sometimes sap your sense of wonder. Or maybe its just me. If you are one of those people who feel mired in tech and sometimes feel like the ‘wow’ factor is gone when you see new innovations…and it elicits a bland ‘hmmm’ reaction and god forbid ‘meh’ – Well you need a healthy dose of art. Attending Ars Electronica helped me marvel again at what artists, architects, performance artists and idea mongers have to share. Below I will share afew of the pieces i particularly enjoyed, and provide some links to blogposts by the other wonderful speakers and friends from the Cloud Symposium. 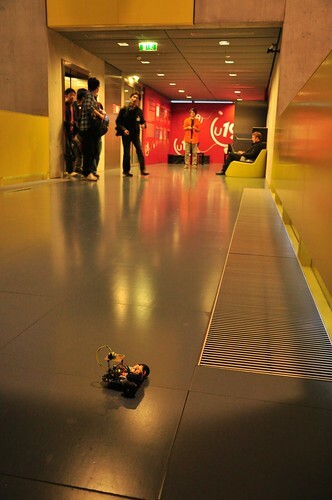 Since I have a thing for mobile phones (Nokia) I greatly enjoyed the robot controlled by bluetooth. This is a picture of the phone. This is the little robot it controls. How fun! This is basically the livescribe pen on steroids. You can write and record audio which is digitized and transferable pdf docs or uploaded online. The steroids bit: The Anoto pen can be used to navigate a map, displaying relevant data on a big screen. For example, if you click on a specific point on the map of Linz, and would like to know the demographics of the region, you can tap on the legend provided on a page to give you stats on number of divorced people between the age of 21 and 45. This was preety cool because it combines maps, tactile input of using a pen and a digital display to add more data. I got to play the loopscape game with the renowned tech journalist Cyrus Farivar. I really could claim victory, but really…it was a draw. The action does not take place on a flat display but rather on a 360 degree band arrayed around the edge of a ceiling-suspended metal doughnut circumnavigated during play. The object is to shoot down the opponent. But be careful! If a fired missile misses its target, it continues on its trajectory and threatens to strike from behind the game figure that launched it. This loopscape game is a form of interactive device art, and for some reason, it brought to mind the idea of participatory art. Something that Wambui, Sciculturist and I were discussing at RAMOMA gallery in Nairobi. Check out this ‘Watoto Wa Kwetu’ piece by Wambui. More pics are on this flickr set. I think the loopscape game has participatory qualities just like the Watoto wa kwetu paintings, because both pieces are best experienced with others. There are some observations that Wambui made on the Watoto wa kwetu paintings that I would not have noticed. Do note that the paintings are done by a group of children, and not one artist. So, there is that aspect too. This is just but a sampling of what was in store at Linz. I havent even touched on the animations. I hope you enjoy the perspectives shared by the others on the Cloud Symposium blog, videos posted there and the following links too. Kristen Taylor – Mosaics, food and the cloud If you are wondering about her cool dress, its vintage. I had to ask 🙂 I am not much of a beer drinker, so her suggestion to get some Secco (Austrian white sparkling wine) with our dinner was just invaluable. David Sasaki – An outsider’s guide to Linz Indispensable. 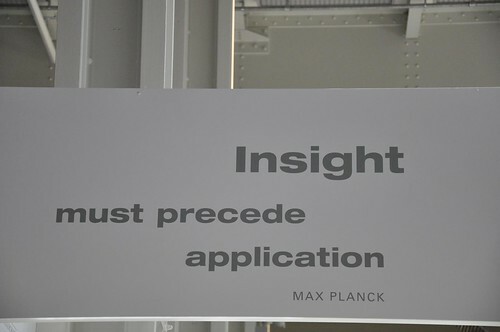 His talk about cloud intelligence provided the framework for discussion that day. I keep digressing from this nerds need art theme, but hopefully i can tie it all together. In the quest to not lose your sense of wonder, sometimes you need to look inward, be quiet and just think about the bigger picture. To find the creative place. If you’ve ever used the words ‘code is poetry’ ‘Math is elegant’ or ‘no doubt the universe is unfolding as it should’. There is this need to look inward, to find that inner muse and embrace the imagination. I think whenever you need to go to such a place, art can provide that gateway. Africa is hot for business now, and its popping up in Time Mag’s trend watch. Great to see that ideas espoused at TEDGlobal Arusha 2007 are reaching the ‘center’ from the fringes. It’s great to see Time magazine present some trends that are not obvious, well-worn, are already over. 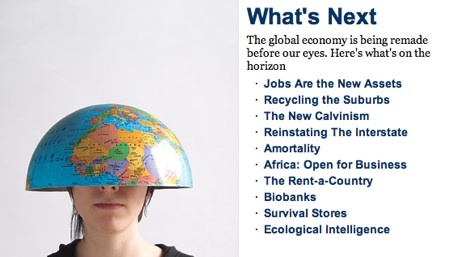 They take a chance in this list of ‘10 Ideas Changing The World Right Now.‘ The line up includes not your usual suspects. With any list like this, there is no telling which are likely, but they are at least plausible. Two extra points for a positive African scenario. The ten trends are featured in the pic below; details at the link. In the back of my mind I couldn’t help but wonder…what of the global economic crisis? Wouldn’t that put a dent in this positive outlook? Oz has a great run down of how the global crisis affects Africa. 1. A slump in external demand affects exports and remittances. 2. A slump in external demand lowers commodity prices. 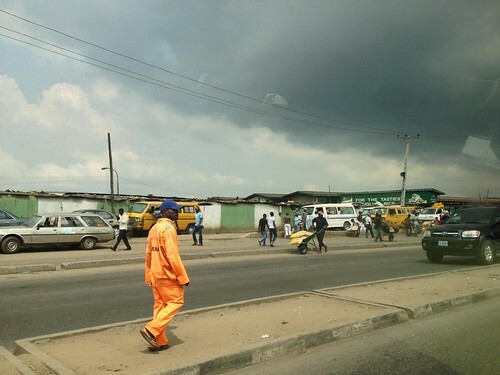 Oil producing nations such as Nigeria are particularly vulnerable. 3. Lack of credit is stifling capital inflows and trade finance in the more advanced markets like Nigeria, Botswana, Ghana, Kenya, Mozambique, Tanzania, Uganda, and Zambia. 4 The region is not immune to financial problems of its own. Credit has ballooned in many countries. Banksâ€™ loan books are often concentrated in commodity-related industries. 5. Some retail investors borrowed heavily to punt on local stock markets. You can also follow OZ on twitter.